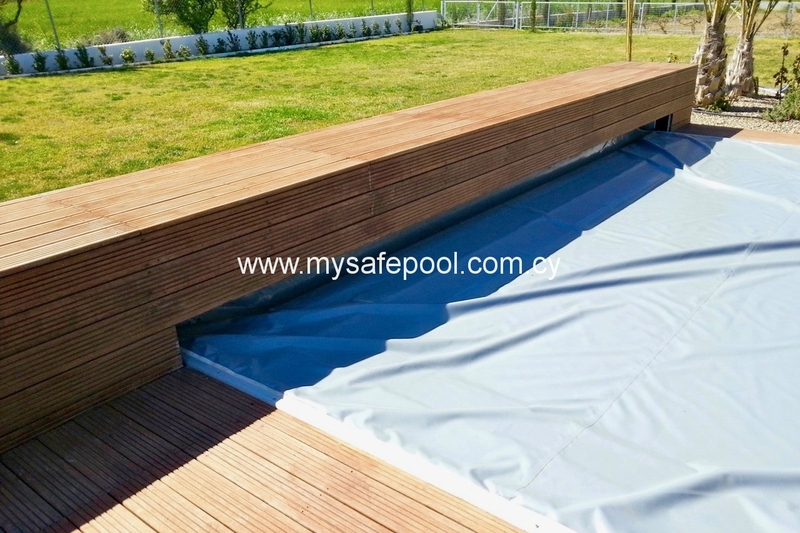 DESCRIPTION: Our “Astraeus” electric and electro-hydraulic safety covers are the ultimate in terms of ease of use. Twist the security key one way to open the cover, twist it the other to close. 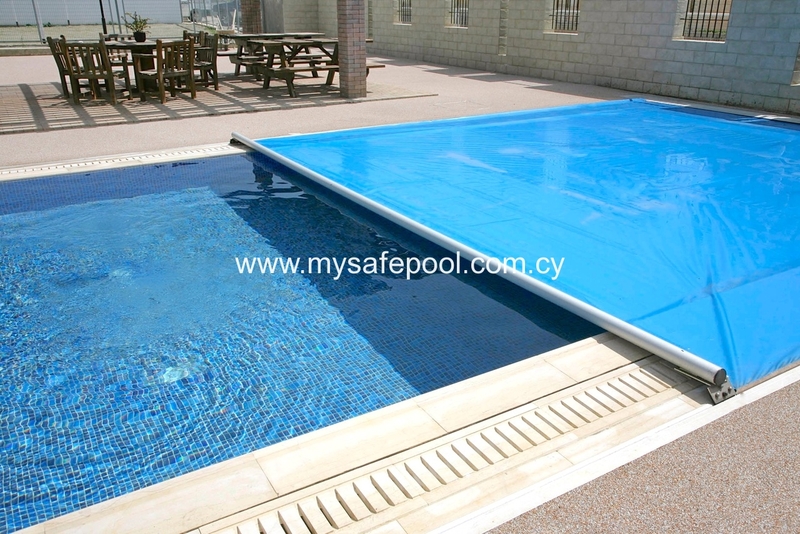 For small and medium-size pools the electric version is simplest and best. 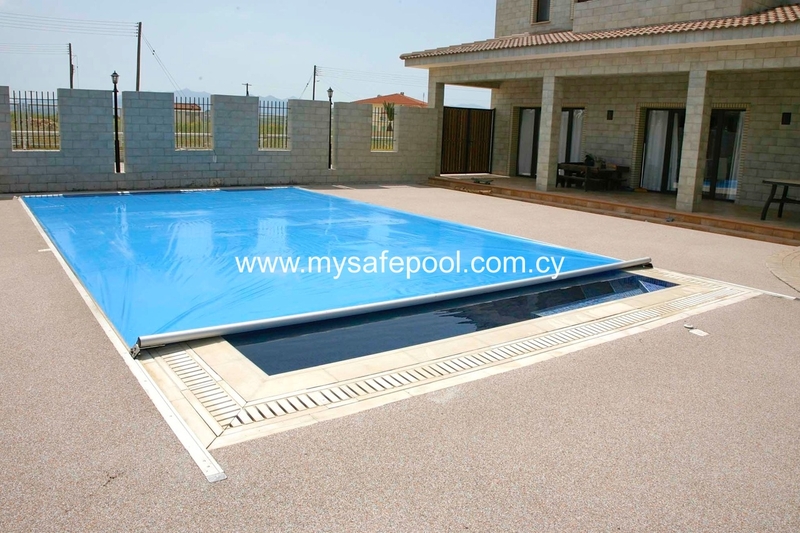 For larger pools, where greater torque (pulling power) is required, electro-hydraulic performs better. For both types of cover you will need to provide an electric supply close to the location of the switch which operates the roller mechanism. 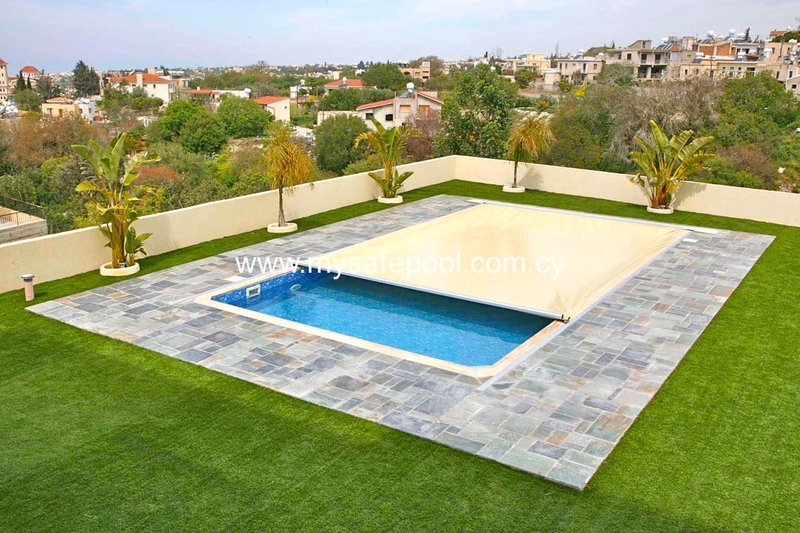 The Astraeus operating mechanism and roller can be installed below ground (new pools with pit) or above ground (existing pools). 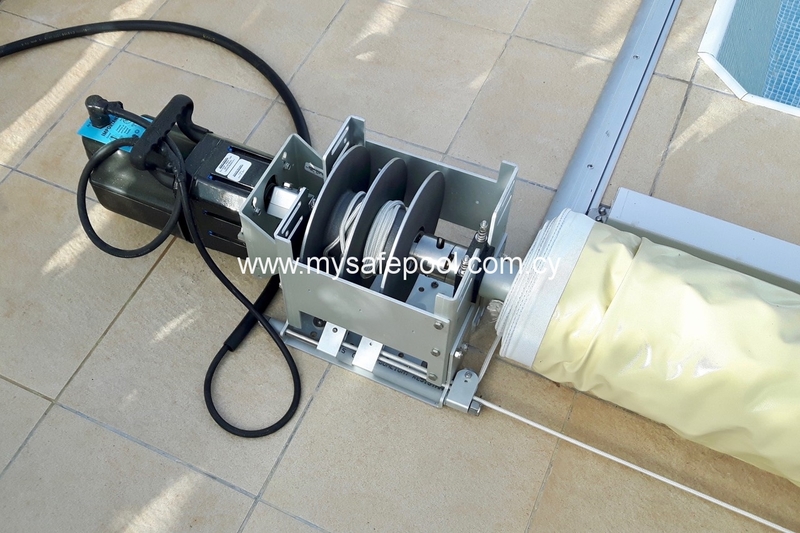 When installed above ground, the mechanism and cover can be concealed within a wooden box. 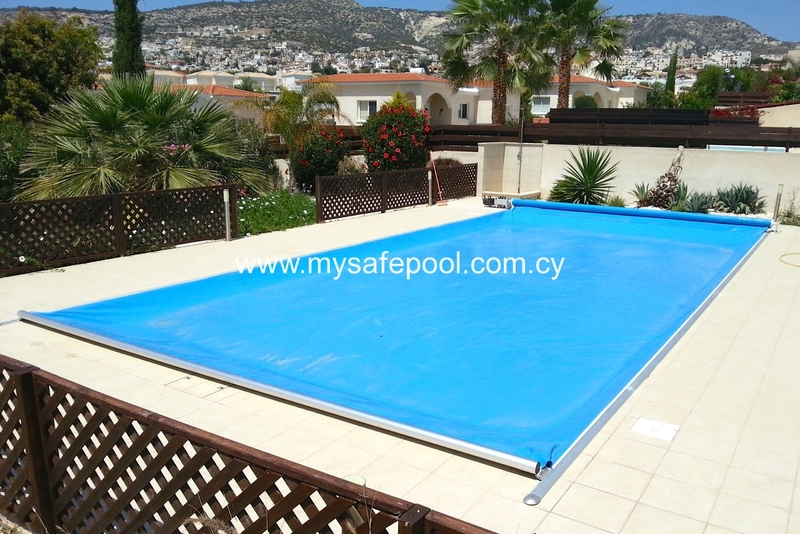 The anodised alloy tracks have a smooth, rounded, 16mm high profile and are installed either side of the pool, on top of the deck. For extra cost, in-ground, recessed tracks are available; these are just 1-2mm above the surrounding deck. 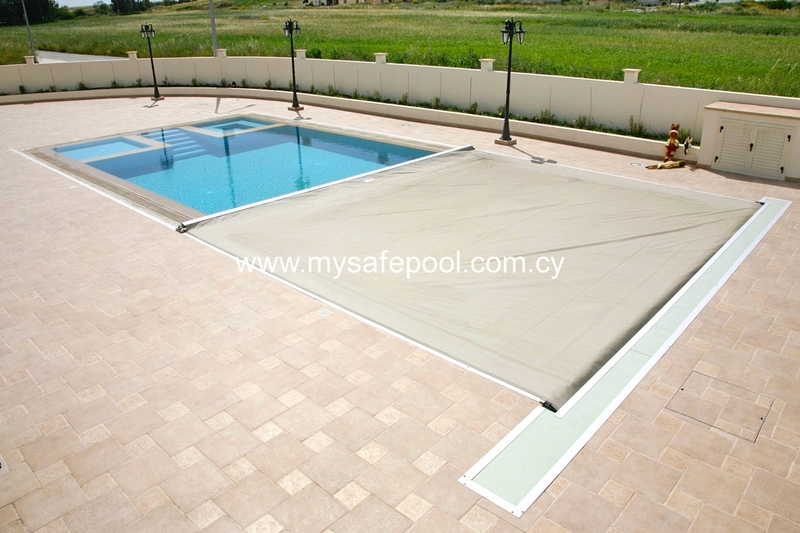 The Astraeus automatic cover can be installed on skimmer, overflow and infinity (vanishing edge) pools. 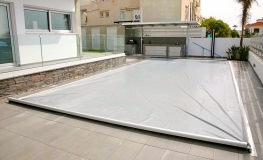 Astraeus covers can be fitted to pools from 6 x 3m up to 14 x 7m in size. 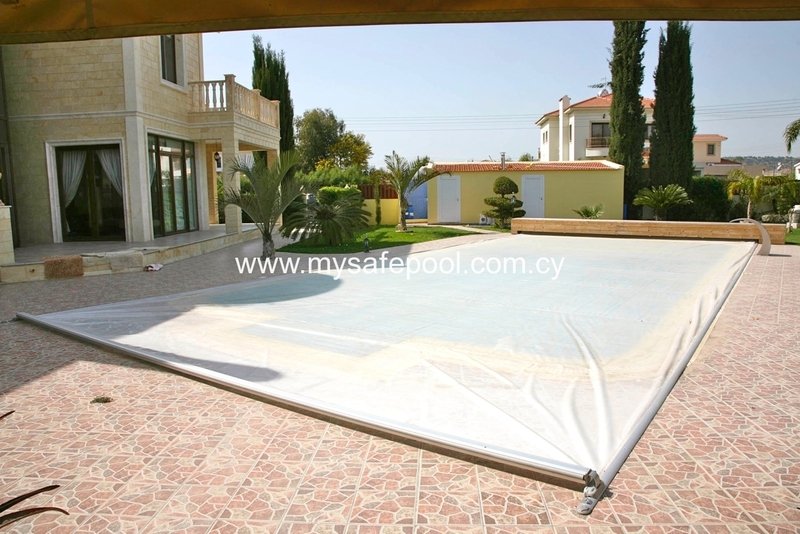 The cover can be installed on rectangular or shaped (eg. 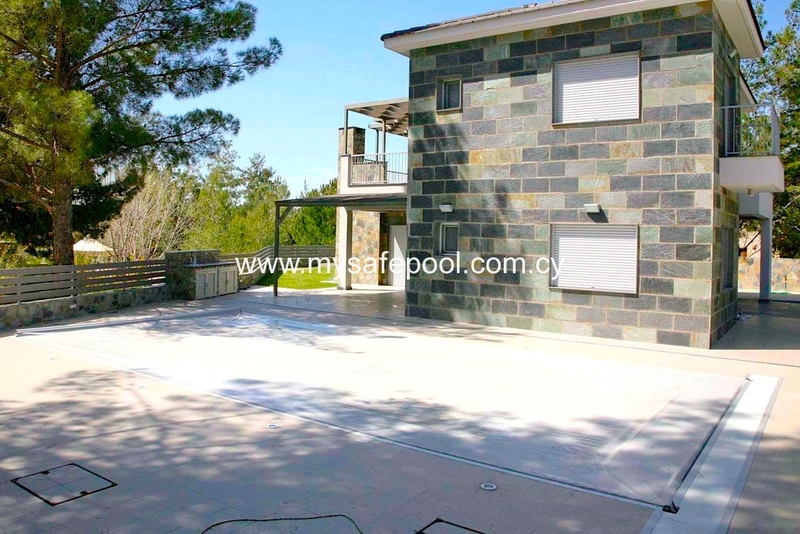 kidney-shaped, figure-of-eight) pools. 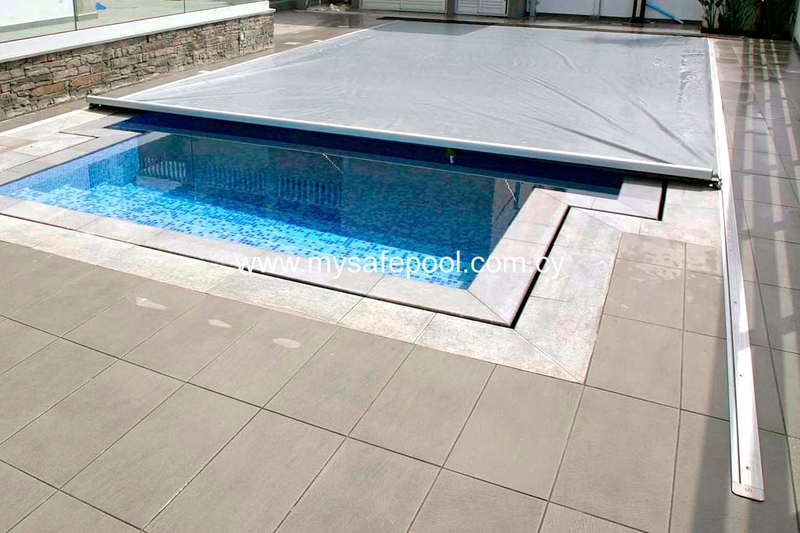 The alloy track can be secured to all types of pool surround: ceramic tiles, crazy paving, stamped concrete and wooden decking. The Astraeus automatic cover is a proper safety cover and can be walked on (in stockinged feet). The cover comes in a choice of 5 stock colours: light blue, dark blue, beige, light grey and dark grey. We provide a free-of-charge submersible pump with sensor. 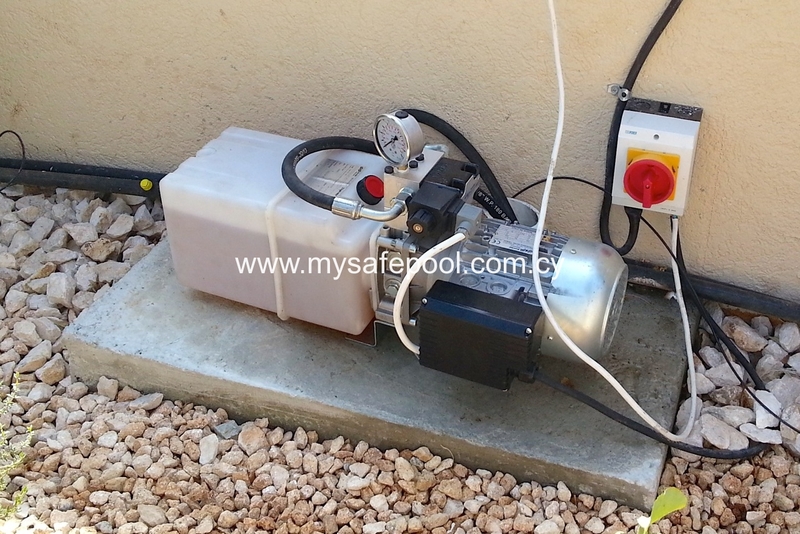 The pump sits on top of the cover and automatically removes surplus water whenever it rains. 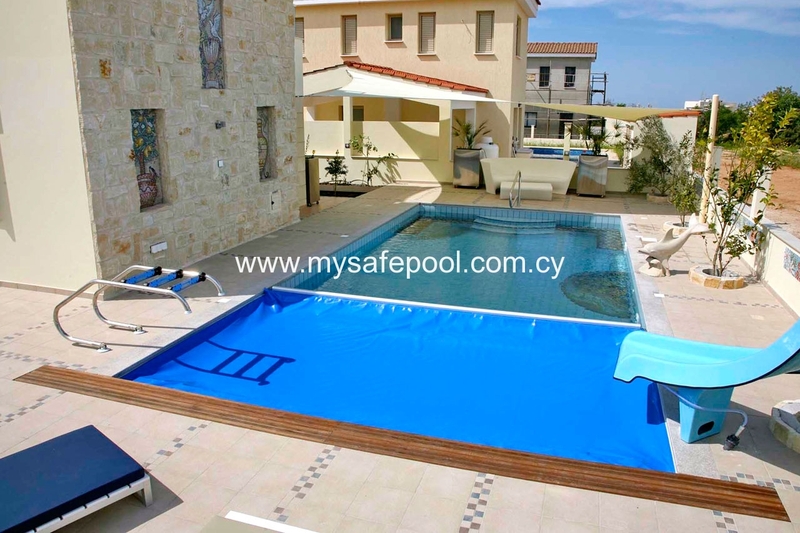 Pool can be opened or closed in just a minute or two. 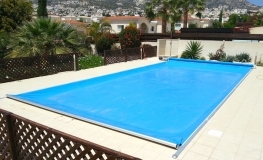 Pool cleaning is reduced by 95% – saves money! 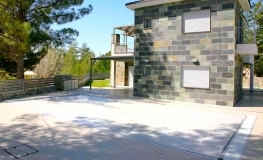 Water evaporation from the pool is reduced by 98% – saves money! Chemical consumption is greatly reduced – saves even more. 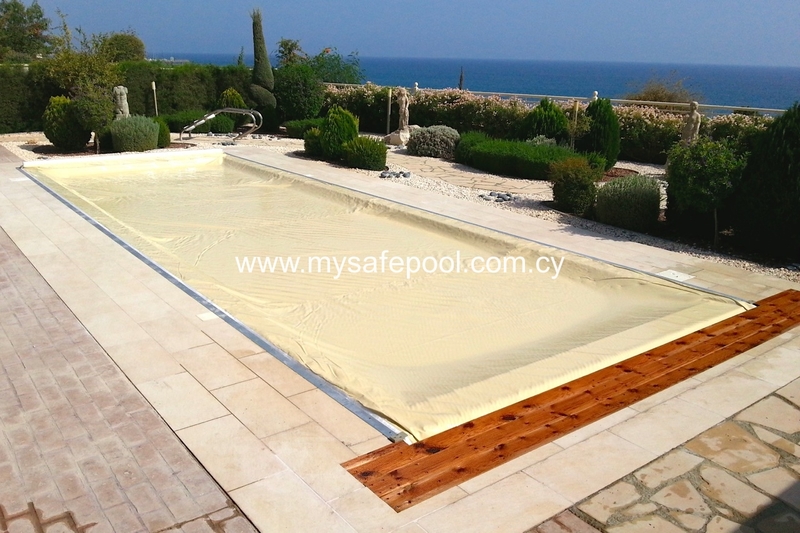 Cover minimises heat loss from the pool – extends your swimming season. 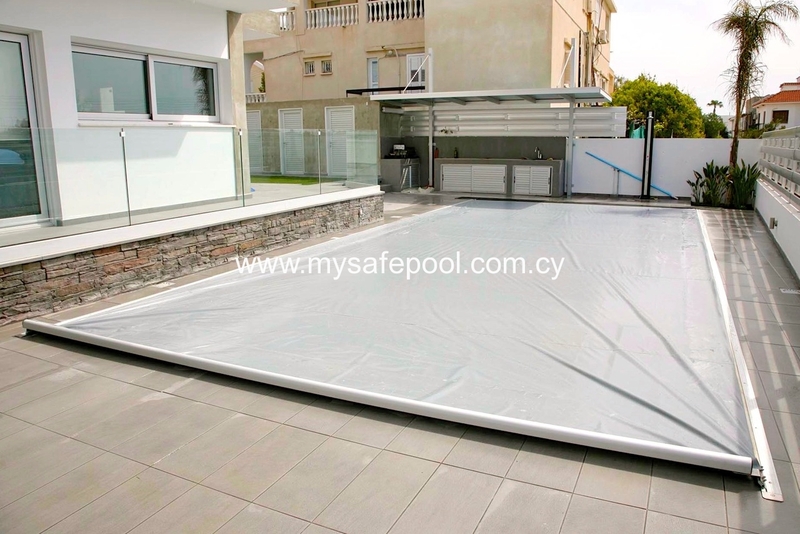 WARRANTY: Our Astraeus automatic safety cover comes with a conditional 2 year warranty.